At the end of October I mentioned that I had been tinkering with a knitting pattern for mug sweaters. I said I would elaborate in due course, and now finally here are the details. 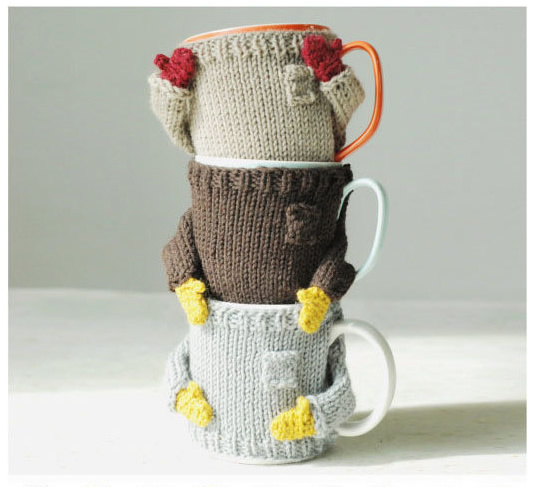 I first saw this mug sweater when Crafty magazine posted a photo of it on their Facebook page. 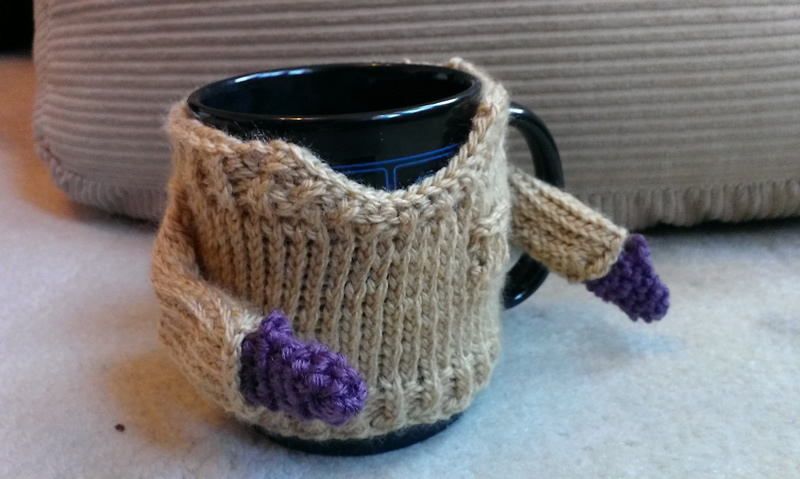 It appealed to me at once: cute and quirky, and related to hot beverages. WIN. I went and found the pattern, which is by Nawanowe (click here to visit their Etsy shop), and purchased it… but immediately found a flaw. Surely the sweater would get wet every time you took a sip of your drink? Nope, it was no good, I had to tinker with it. Knitting is not really my forte, and I’ve never meddled with a pattern before, but I strongly felt that this sweater needed a scoop neck. So I had a play, and my first scoop neck wasn’t bad. I wasn’t 100% happy with it though. I had created the scoop neck but retained the ribbed top as featured in the original pattern. It didnt’ quite work aesthetically, so I went back to the drawing board and tried again. This time I was more successful, and the new-and-improved sweater was born. 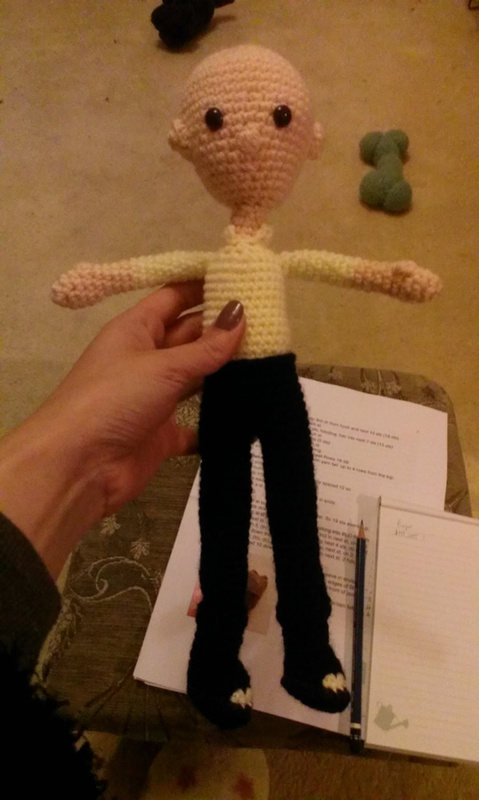 Of course, typically, none of the photos show the wretched neck off properly! 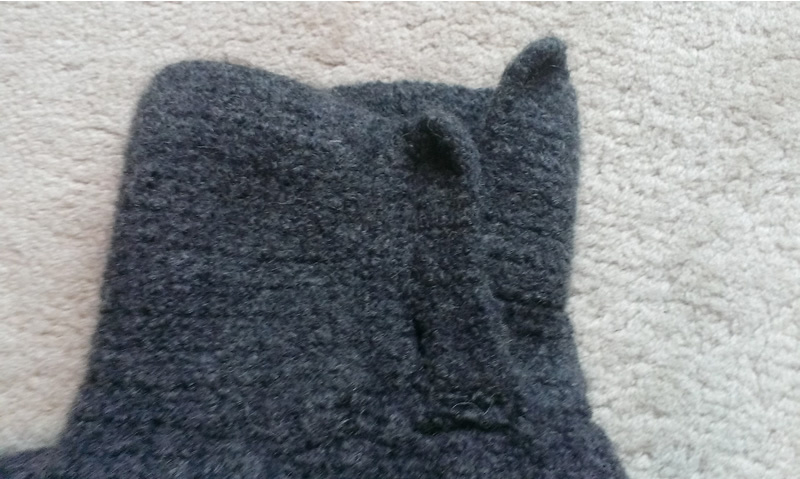 What I had done was use a moss stitch for the top two rows of the sweater, which then carried around the scoop neck nicely and made for a nicer finished look. I was very pleased, and wasn’t the only one as a friend asked me to make four sweaters for her to give as gifts (the ones pictured above). Will I make more sweaters? Probably, they do make nice quirky gifts for people. Will I be putting the amended pattern up here? No, as it’s not really fair on the people who sell the original pattern. 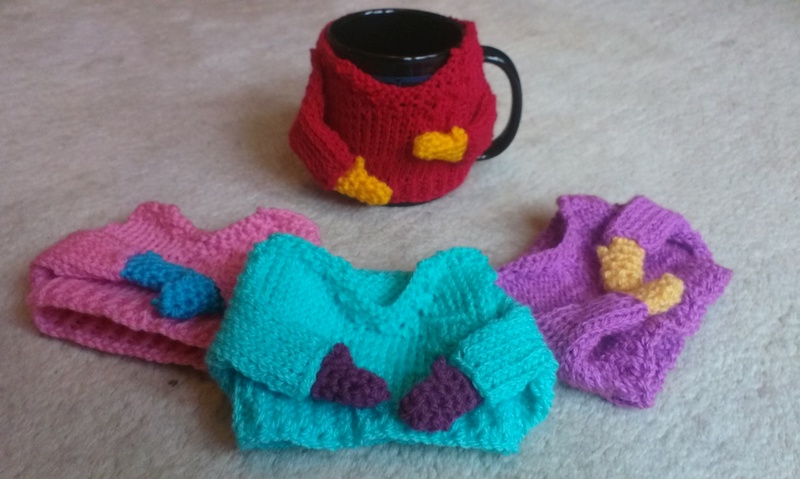 It’s fairly easy to tinker with the pattern though (I made my sweaters a little bigger too, as the original pattern was just a smidge too small for my mugs), and at just £3.13 it’s a complete bargain so I highly recommend buying it (click here to visit the Etsy listing). You know when you’re sure you’ve already written about something, but it turns out you haven’t? That. 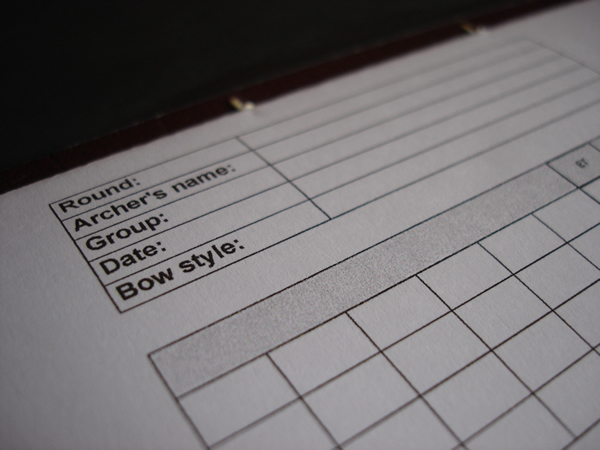 So…last February a friend asked me to make him a notebook in which to record his archery scores at tournaments. 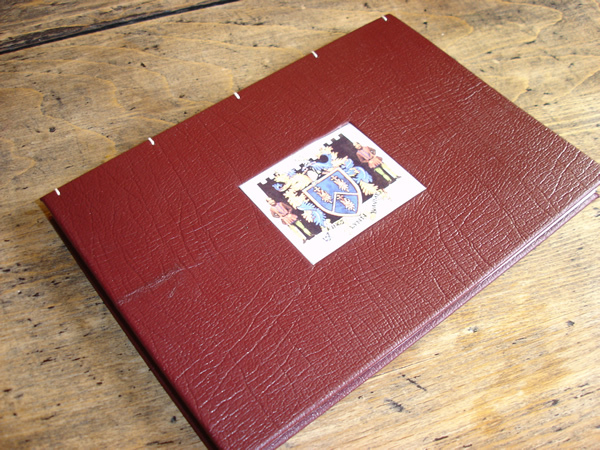 He provided the template for the pages, and the logo of the archery club to which he belongs, and after that it was just a matter of putting it all together in a pleasing format. 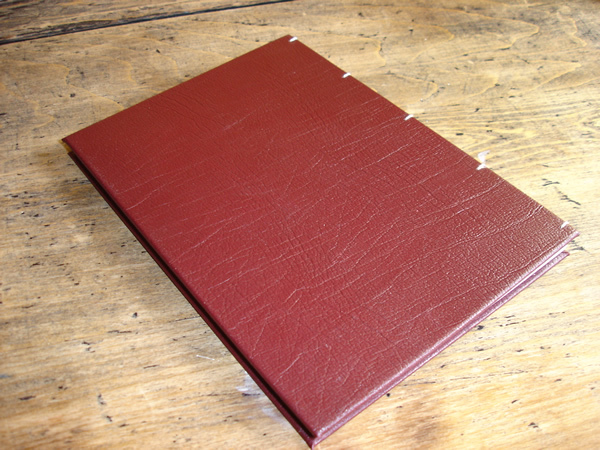 The book is A5, coptic bound, and the covers are a hardwearing burgundy leather. Simple, but effective. No, this isn’t a post about deception – but I couldn’t think of any other quotes which had the word ‘weave’ in them. I have always been intrigued by the craft of weaving, and my interest has been further piqued by seeing various looms and examples of weaving at various craft shows. 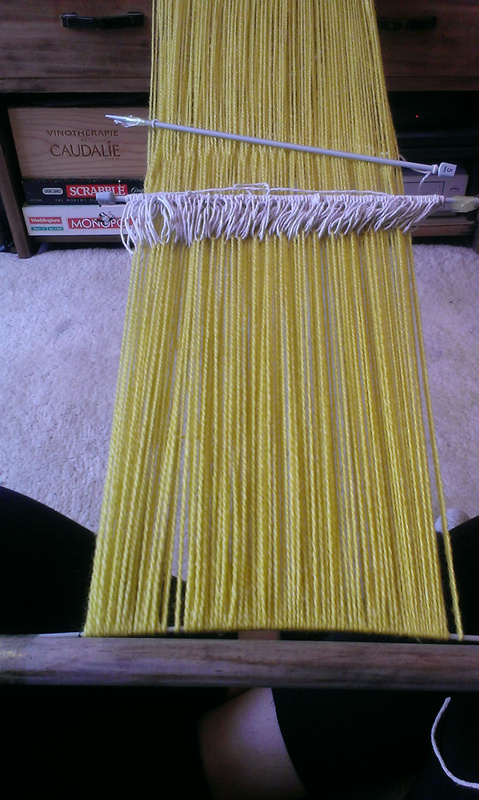 Sadly looms aren’t exactly cheap, and of course they generally take up space (which is something I lack), so it’s one of those things I’ve longed to try but have kept putting off. Last year I did a bit more research, convinced that there must be a cheap and easy way to try it out. You see, I love making blankets (either crocheted or knitted), but I really wanted a different texture – the sort that only weaving can provide. 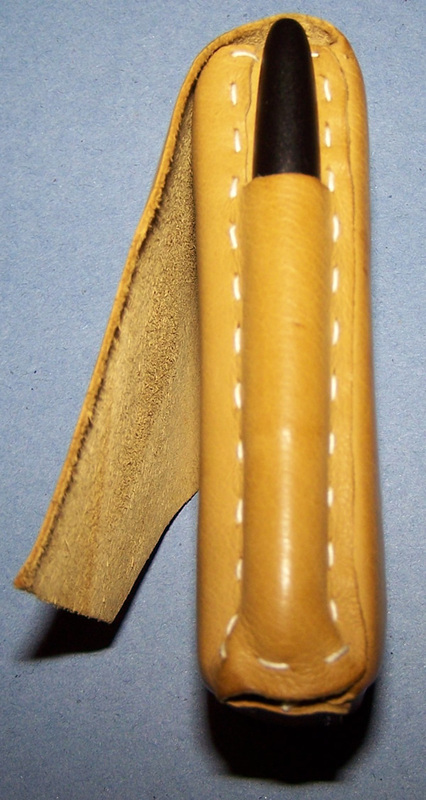 So I Googled away, and eventually found lots of information on backstrap looms. 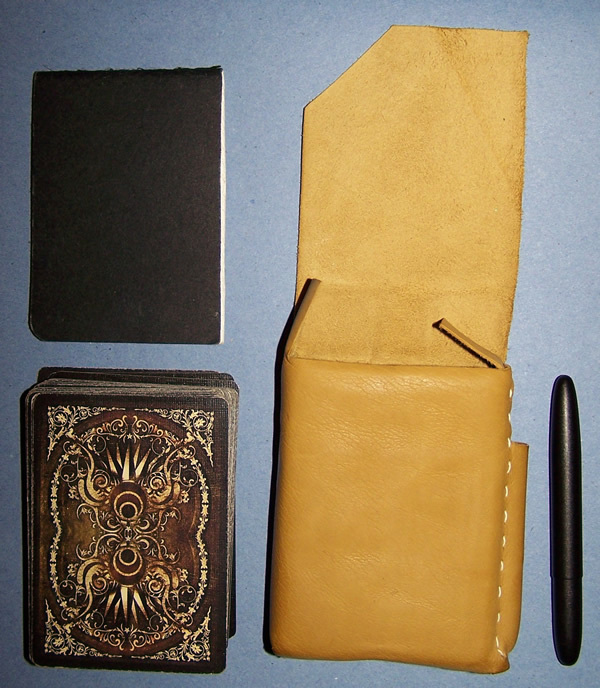 These seemed the perfect solution: they can be made very easily, the components pack up into a small space when they’re not being used, and it’s a portable craft (as I sometimes craft in my studio, and sometimes in the house, portability is a very attractive thing). 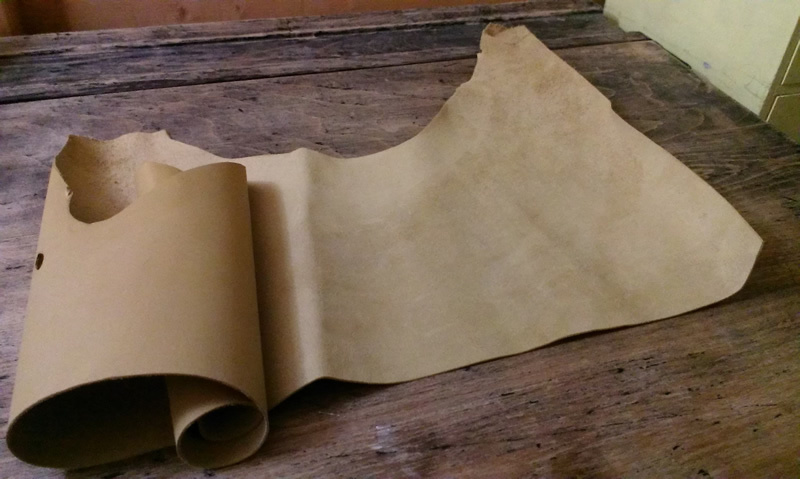 I found a great article which described in detail how to construct a backstrap loom, and it’s so well written I won’t bother trying to rewrite it – just click here to visit the site. So, I had a rummage around the house and garden and came up with all the bits and pieces I needed: an old broom handle, sawn into four lengths (two for the loom bars, one for the roll-up stick, and one for the shed rod), a knitting needle (for the heddle stick), a wooden ruler (for the sword/beater), a pashmina (to use as the backstrap), and a bit of mountboard (cut up to make a shuttle). 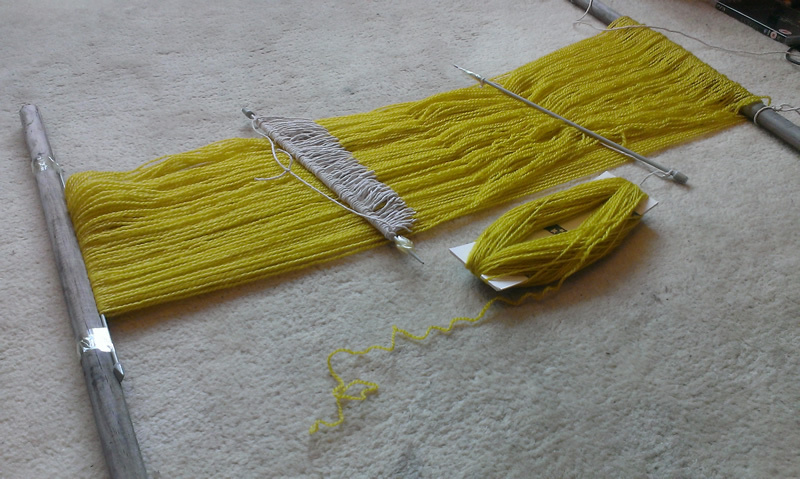 I chose some wool I bought in Amsterdam which I thought would make a nice vibrant bit of weaving, and off I went! I started off in the studio, as I needed a table onto which I could clamp some wood to wind the warp around. 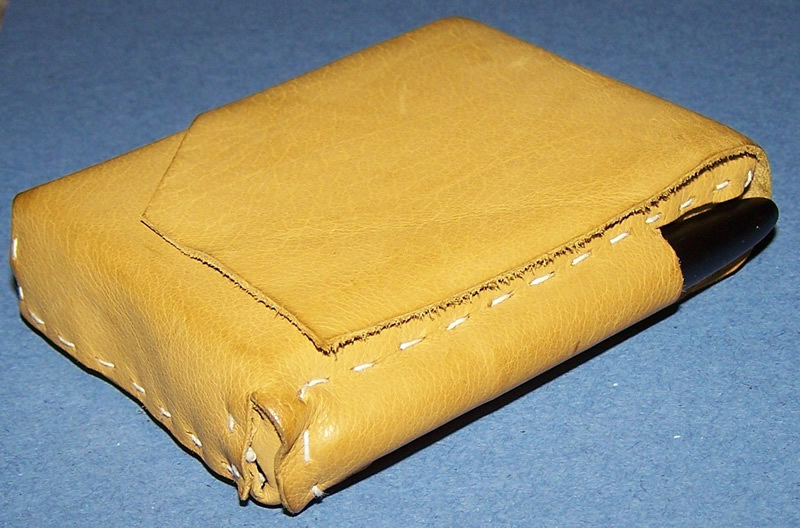 This took a while, and then there was the tedious business of making a continuous string heddle. This probably all sounds like gobbledegook, so I would suggest having a read of the tutorial if you’re a bit lost! 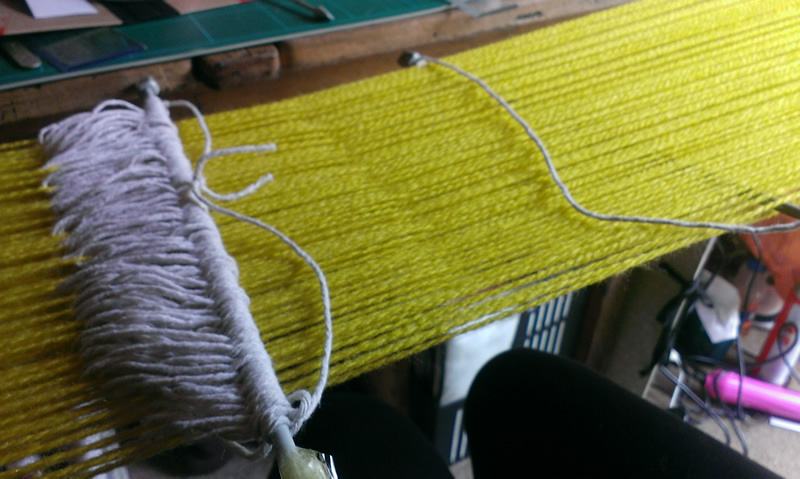 I eventually got that sorted out, transferred my warp to my loom bars, and then went back into the house to find somewhere I could sit and weave. I ended up sat in front of a chest of drawers, with the top loom bar trapped inside one of the drawers (the instructions say to hang it from a door handle or hook, but I didn’t have any that weren’t in terribly inconvenient places). 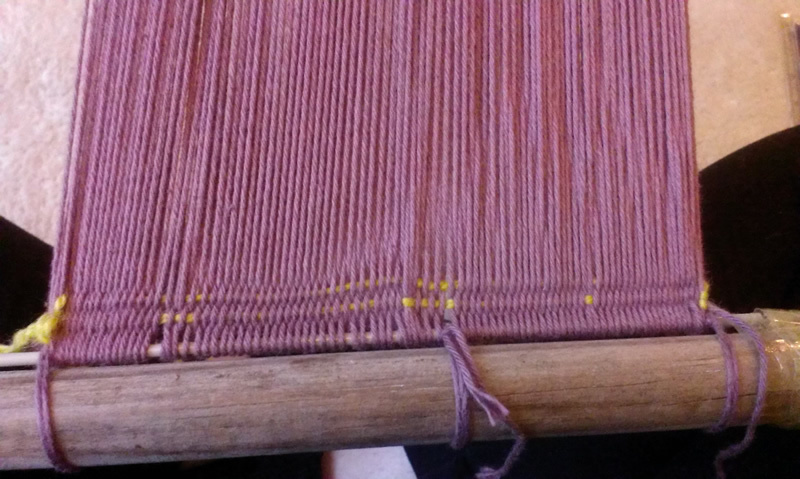 The weaving was straightforward, and I soon got the hang of shifting between the heddle and shed warps. Yes, well, this is very good advice and I really wish I had noticed it before I started out on this little experiment. 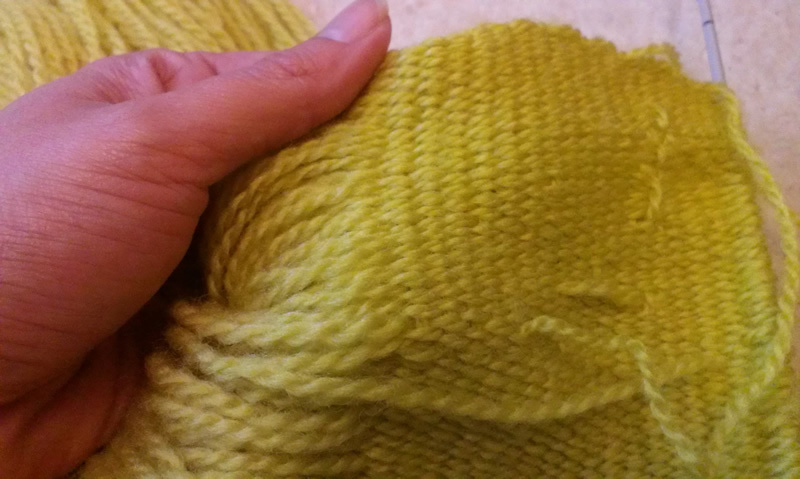 The reason you should choose a smooth yarn is very simple – if you don’t, the wretched stuff will catch on itself and end up felting together. The further along I got, the harder it was to shift between the heddle and the shed. It was at this point that I realised it was an exercise in futility and gave up. It was infuriating! More so because the bit that I had managed to weave was perfect texture-wise: lovely and soft, with a good drape. I dream of one day making a blanket this way! 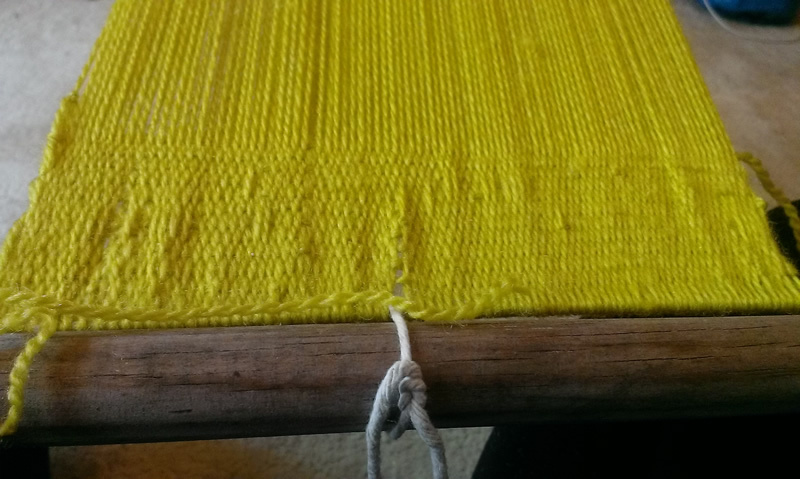 I decided to give it another go, using a smooth cotton for the warp this time, but still using the same wool as the weft… and then learned that this wasn’t going to work because backstrap weaving puts the warp to the front, which means you see the warp and not the weft in the finished fabric. 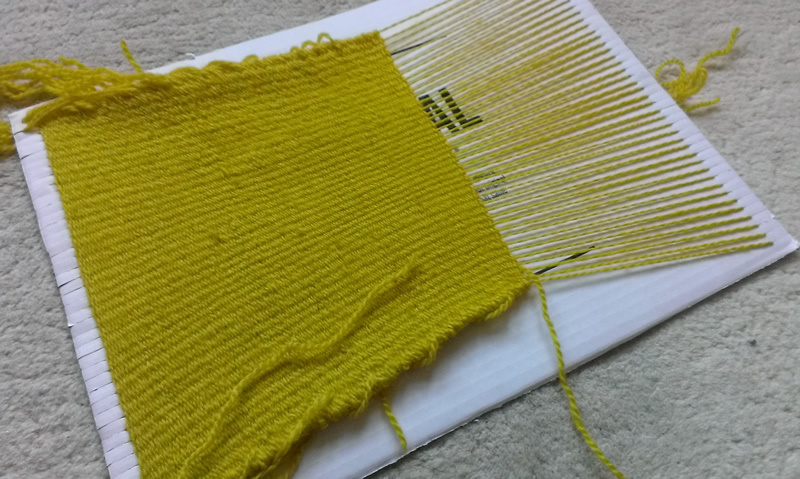 This was a huge disappointment, and it was at that point I decided to shelve the idea of backstrap weaving for the time being until I can afford to invest in some suitable yarn for it. 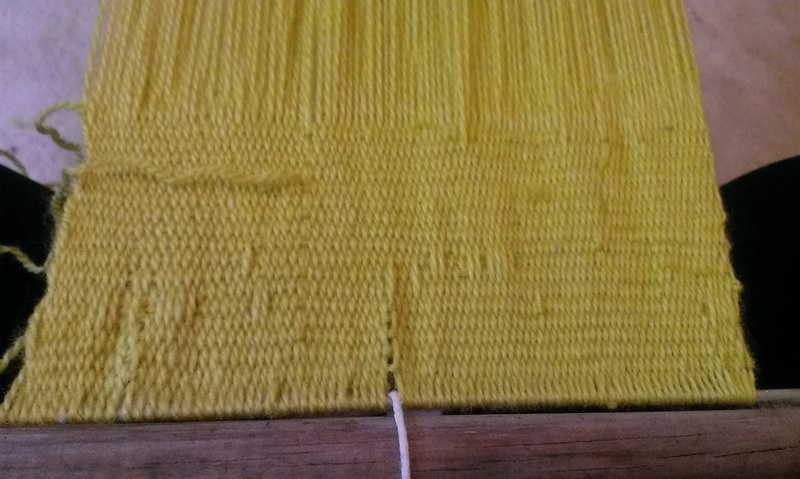 It was a good experiment though, and proved that it is possible to weave with minimal outlay on equipment. I fully intend to return to this at some point, hopefully within the next year. ..it’s actually still in that state because I got distracted by other things, but I do intend to go back and finish it. 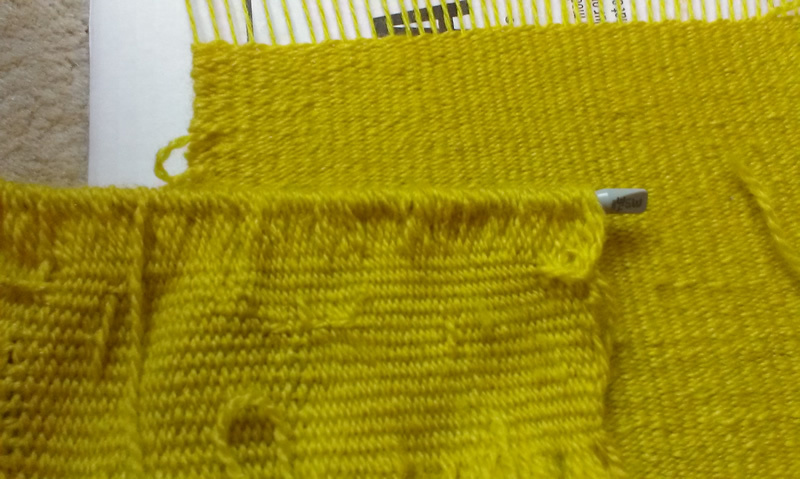 As you can see I was a bit overenthusiastic and ended up pulling the edges in a bit, which is A Bad Thing as it warps (sorry, no pun intended…) the shape of the fabric. 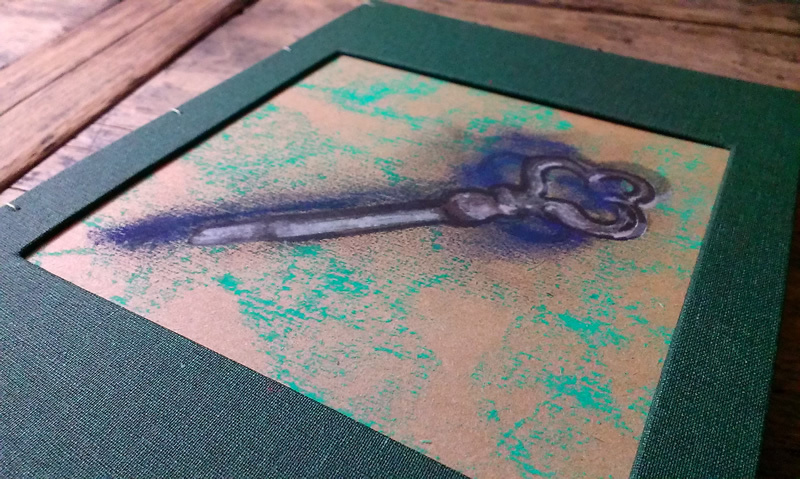 However, I have a vague plan to finish this piece and then weave the next piece directly onto it, which I hope will help straighten it out a bit. This might be a long term project that I pick up every so often, as it really does take up minimal space, so I will post another update in due course. The only disappointment with this type of weaving is that it doesn’t give as nice a texture as the backstrap weaving. 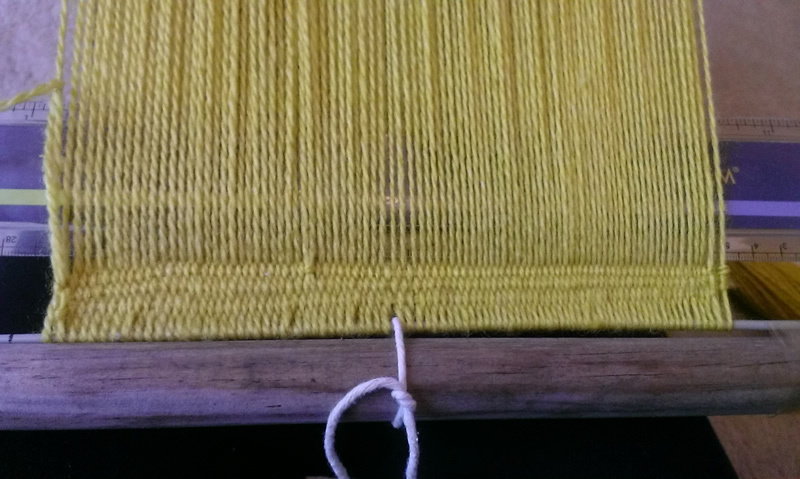 It was interesting to compare the two different styles of weaving: you can see that the backstrap weaving is a warp-faced weave, whereas the cardboard loom yields a weft-faced weave. I prefer the former (which seems to have a softer drape), but beggars can’t be choosers! 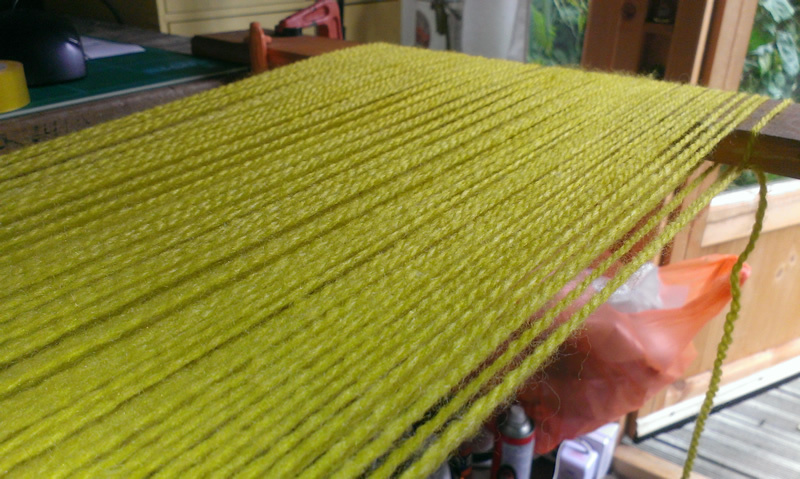 I hope you’ve enjoyed my little foray into weaving, and would love to hear if you have any tips to share. Hmm…that didn’t go so well. 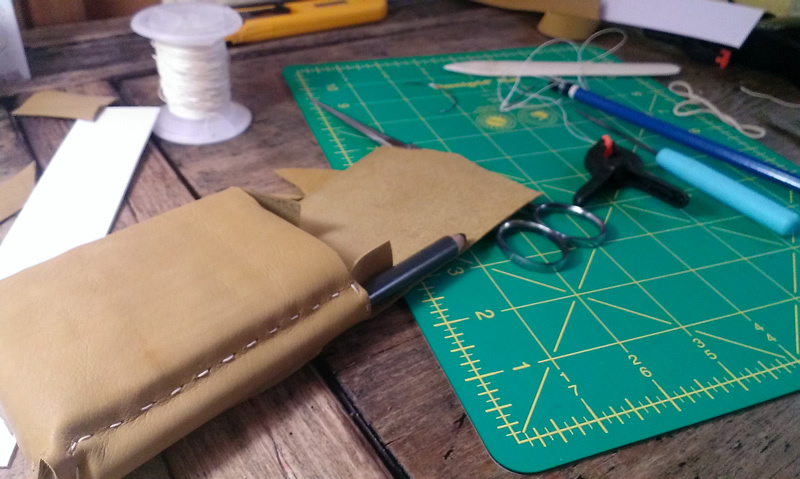 Anyone who spends time crafting will encounter projects that don’t go according to plan. Here’s one of mine, and it’s a huge irritation to me because (as far as I can tell) it’s through no fault of my own. About a month ago I decided I needed some new slippers for the winter and thought I might try my hand at making some felted ones. 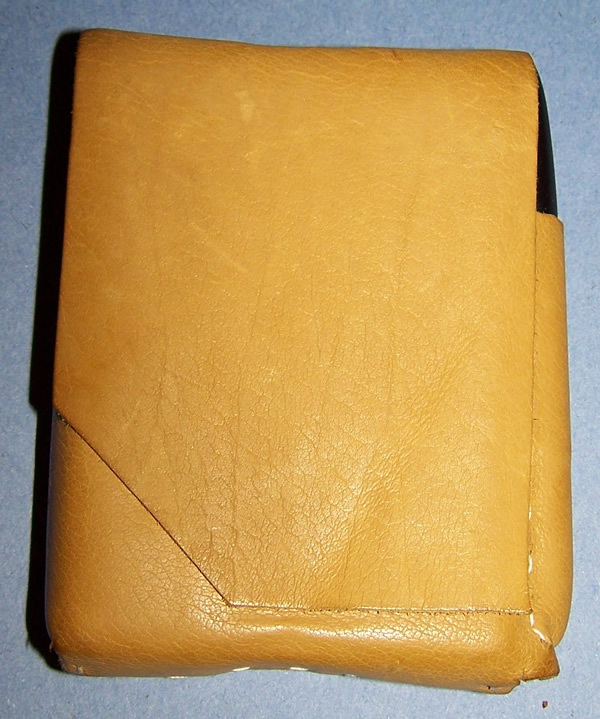 So I had a look around and found a lovely looking pattern on Etsy (pictured above). 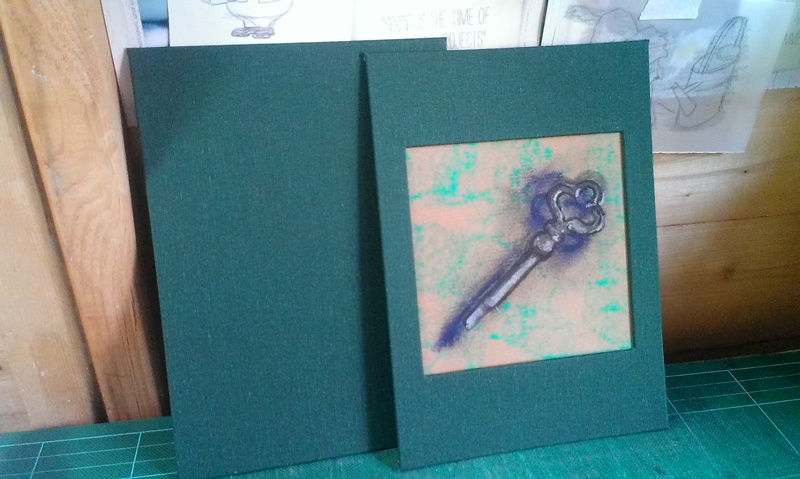 Click here to see it in their Etsy shop. 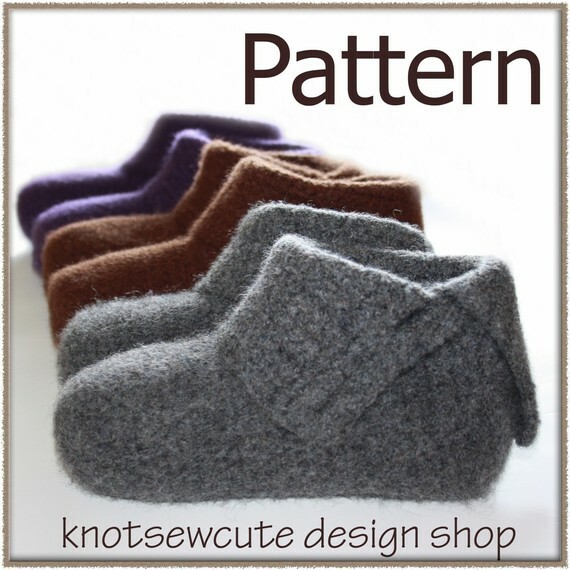 I bought the pattern, and then checked with them about whether they use US or UK sizing, and then went and ordered some wool. Of course the wool they recommend in the pattern is a US thing, so I had to find something else to use. I settled on Wash+Filz it, which I’ve used for other felting projects in the past with great success. 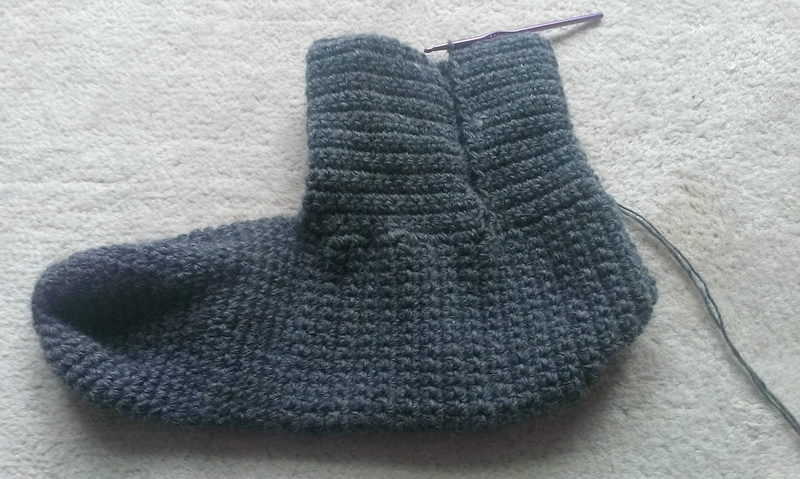 I made a start, and the first slipper crocheted up really quickly… you can tell there’s a but coming, right? But, by the end of the first slipper I was nearly out of wool. This really was a tragic discovery. I had bought 600m and almost all of it had gone into the first slipper – so of course I had to order more, which suddenly made these the most expensive slippers in living memory. 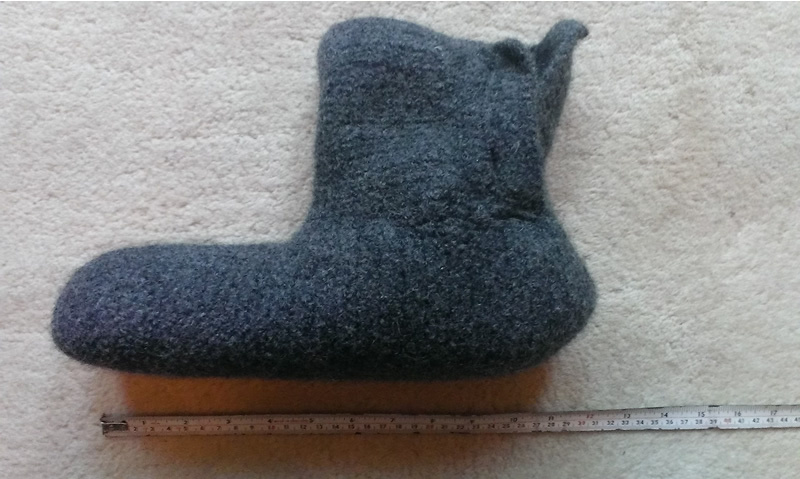 So, the rest of the wool arrived and I got the second slipper made. 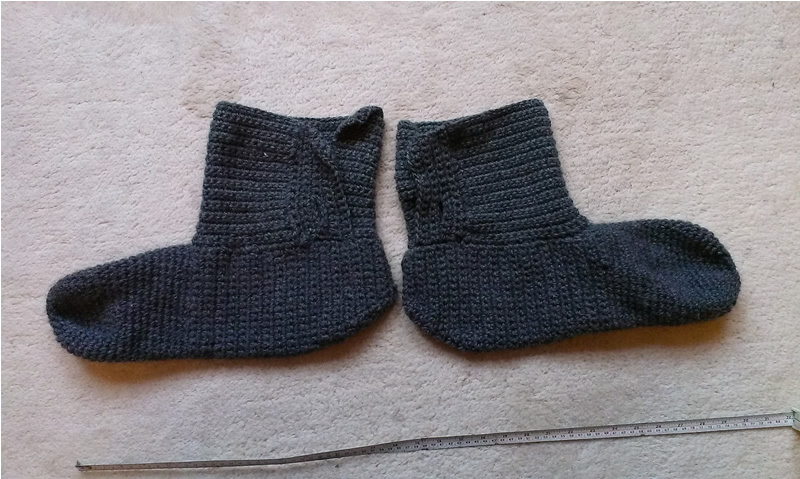 I followed the pattern exactly, apart from shortening the upright ankle bit by two rows (should have been fifteen rows, but I stopped at fifteen because I was running out of wool. 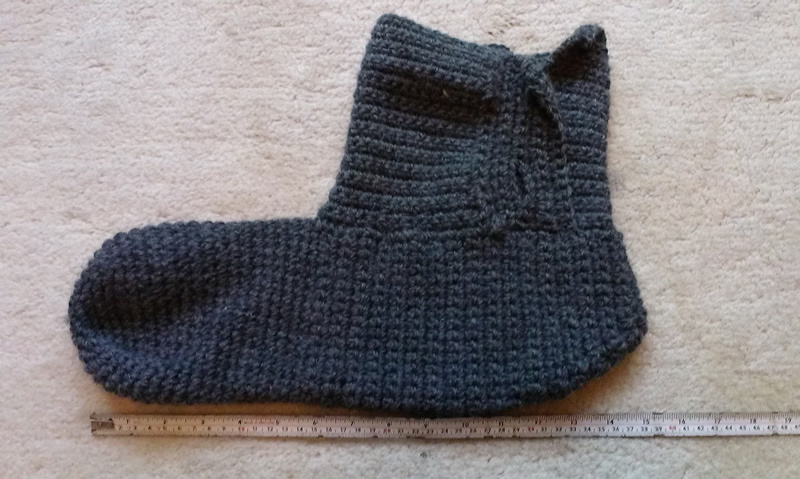 The button band (which is crocheted onto the ankle bit) was kept the same size as stated in the pattern, and actually I thought that would work better as it shouldn’t pull so tight vertically. All looking good so far, right? I thought so, and so I put them in the washing machine at 40 degrees (which is the same as I’ve done for other projects with the same wool). I failed to take a photo of the slippers after they came out of that wash, but basically they were still huge (I tried them on, just to double check!) and hadn’t really felted much, so I put them back in for a second wash (at 40 degrees again). Having to put an item in for two washes to achieve proper felting isn’t unusual (certainly not for me, at any rate), and it’s something I’ve done before with great success. See that, where my thumb is? That’s where my heel ends. Not good. 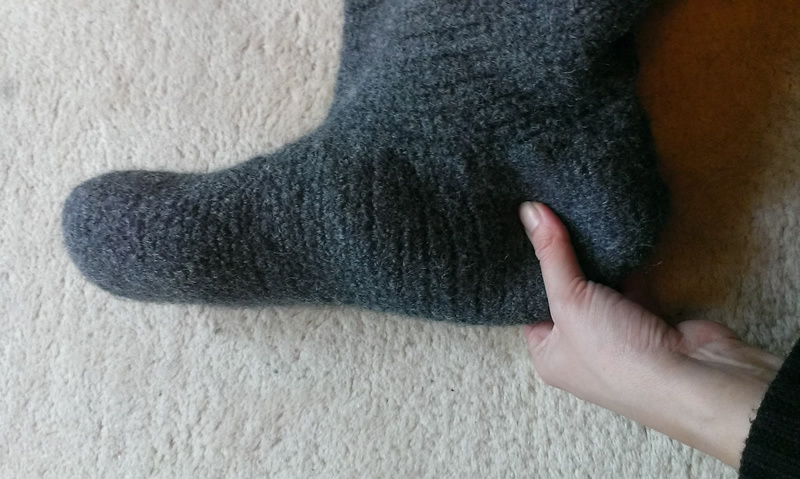 The front half of the slippers were a perfect fit, but the back of them was a clear two inches too long. Total cost of the wool (which includes having to pay postage twice, because I ended up placing two separate orders) was £33. That’s a LOT of money wasted. 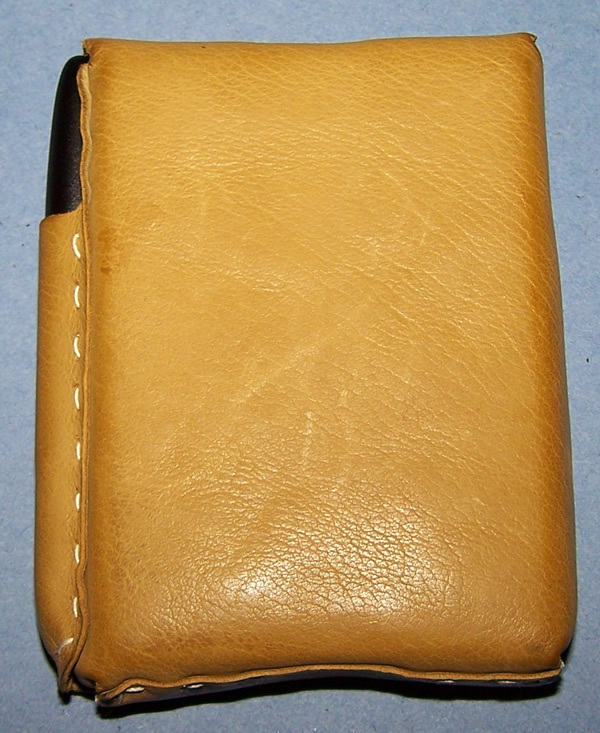 Plus, of course, the cost of the pattern (£3.19). To say that I’m unhappy about this would be a serious understatement. 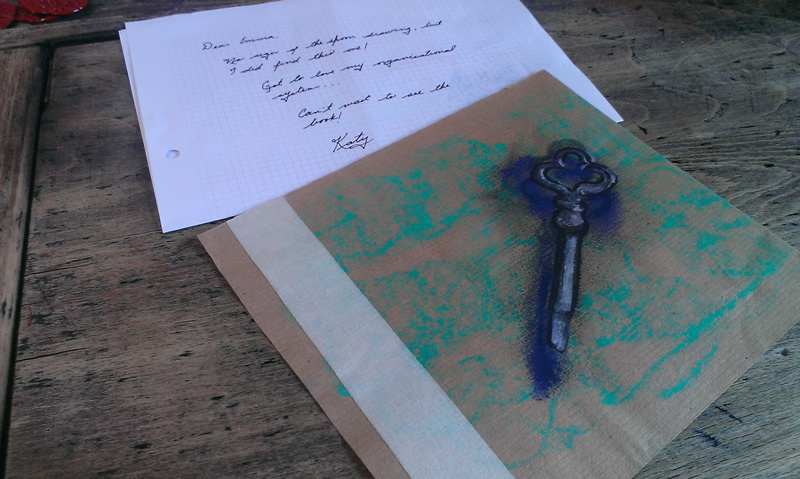 However, I got in touch with Kim at KnotSewCute and had a bit of a chat with her about it (well, messaging back and forth, so the written equivalent of a chinwag). After a bit of going back and forth we both came to the conclusion that it was either an issue with the type of wool (which was different to the type they use – they used a 10 ply wool, and mine is single ply), or the felting itself (they felt either in a top-loading machine or by hand, and I felt with a front-loading machine). Bugger. I really appreciated being able to talk it through with her, and the excellent customer service in that respect is one reason I’m more than happy to recommend them. She suggested that I try to salvage them by hand felting the problem area (the heel and ankle) to try and shrink it down. I’ve decided to cut the slippers down to size, join the pieces using the same sort of yarn, and then try the hand felting. Not sure when I’ll try this, as I’ve sadly become very disillusioned with the whole idea of slippers. Plus I got some slippers for yule, so there’s no urgency any more! As a parting gesture, Kim very kindly offered to let me choose some other patterns which I could have for free! This was a very sweet offer, and of course I accepted. I chose their fingerless mitts, peekaboo mittens, owl cup cosy, and braided fingerless mitts. All gorgeous patterns with techniques (like the crochet cabling) which I’m keen to learn, and not a single felted pattern – until I can find an affordable yarn that matches theirs I think it’s best I stay away from felting! Kim and Tara can be found at KnowSewCute on Etsy and as Kim Miller on Ravelry. I haven’t yet had a chance to start on any of the patterns that Kim so kindly gave me (although I’m now tempted to buy their night owl throw pattern and add that to my growing queue of projects…), but as soon as I do I’ll be back here to tell all about it! Towards the back end of last year the lovely Katy of Creating Misericordia asked me to make her a notebook/sketchbook to use whilst planning her new kitchen. 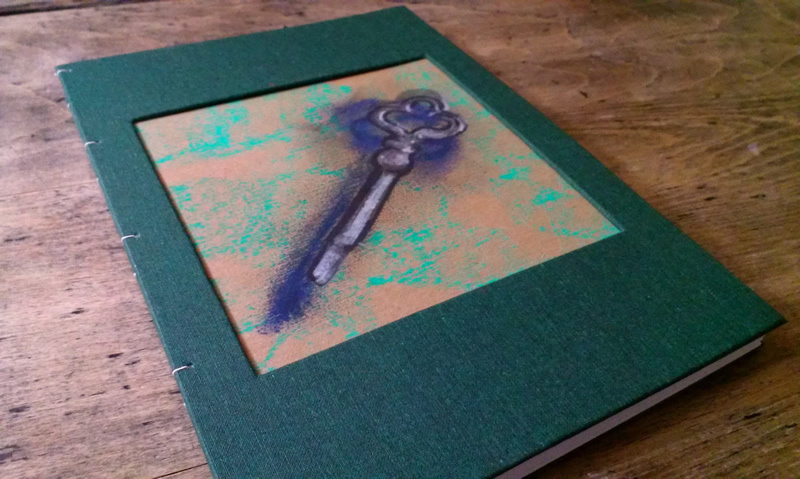 She provided one of her own drawings to use on the front cover of the book and left the rest up to me. 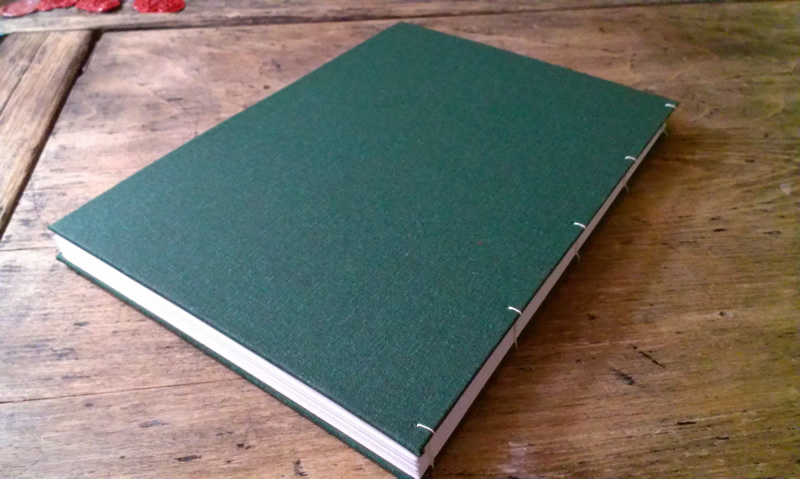 I chose a lovely dark green bookcloth, which I thought would be both hardwearing and attractive. 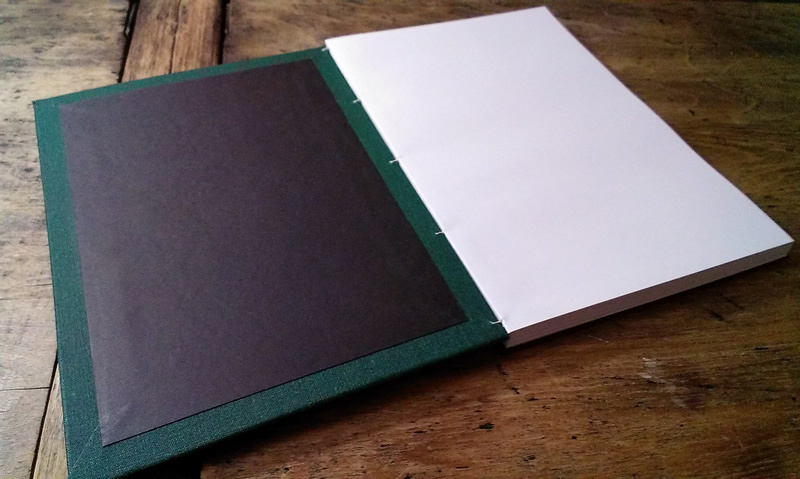 The book is A5 in size, and the pages are a standard white 100gsm as chosen by Katy. 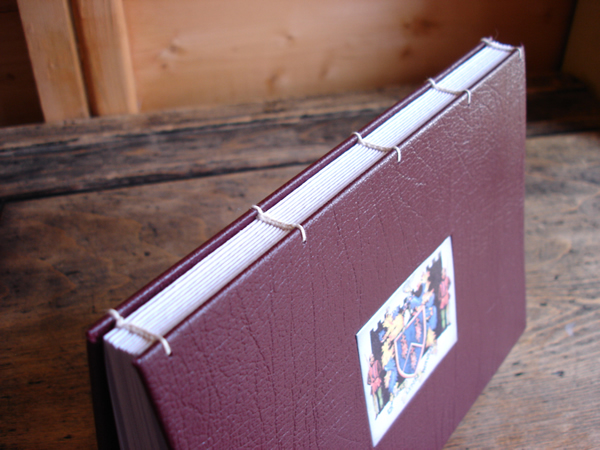 The coptic binding has been done with 100% linen thread, and the bookcloth is from Ratchford Ltd.
It’s been a slow couple of weeks here at The Gift Shed. Unusually, for me, the lazy festive feeling has persisted way beyond the start of the year and I’ve been lacking somewhat in motivation. I’ve spent most of my time walking the doglet, playing with the doglet, and napping with the doglet. 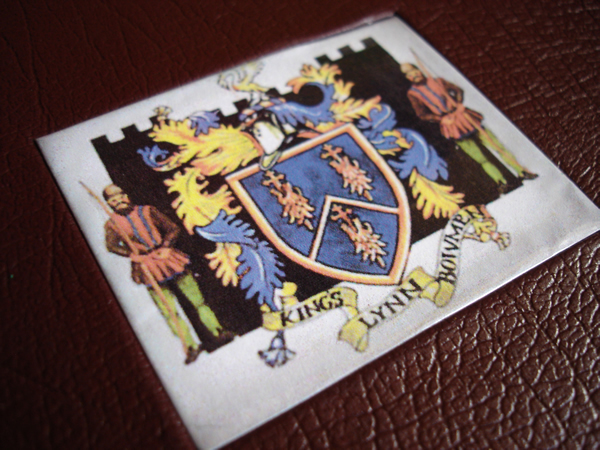 All that dog walking has been quite useful though, as it gives me a lot of time to mull over ideas and designs – so I’ve not been entirely idle! 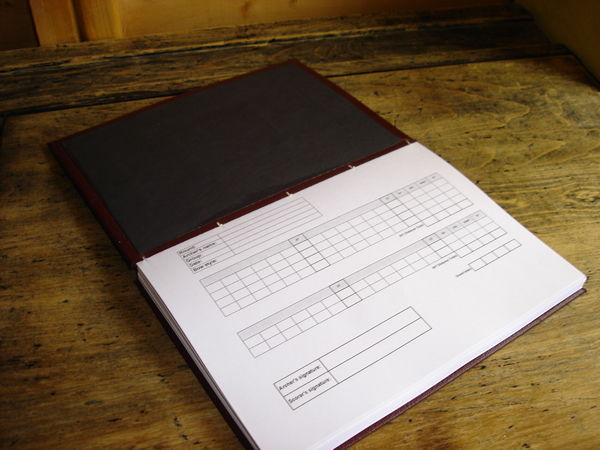 …hopefully I will finish that particular project soon – I hate it when things drag on! 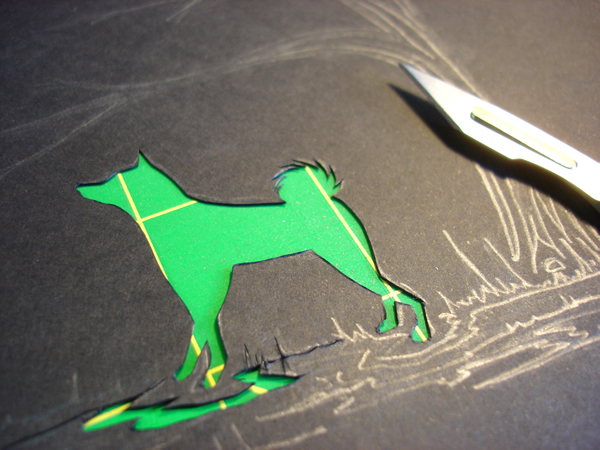 One of the ideas that got mulled over while dog-walking was to do some paper cut designs. 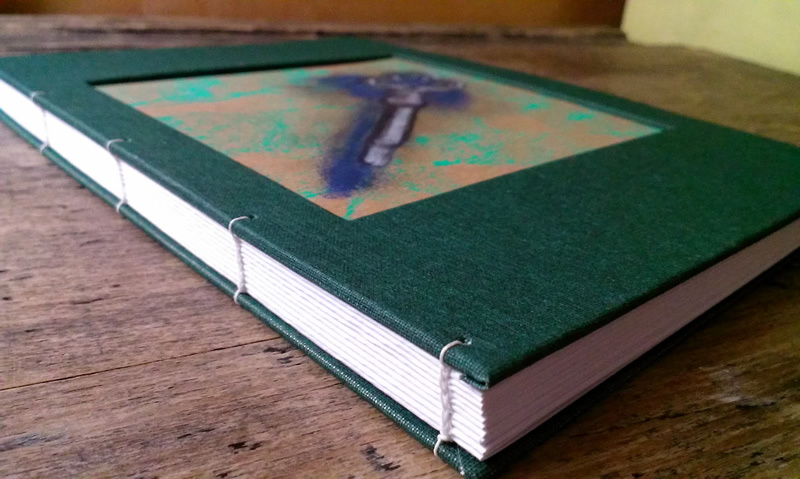 I had my first go earlier this week and will go into more detail another time, but if you fancy a peek at the finished result you can see it in my shop by clicking here.